Human dreams of flight date at least back to about 400 BC with China when the kite was invented. For centures man has yearned to take to the air like birds. 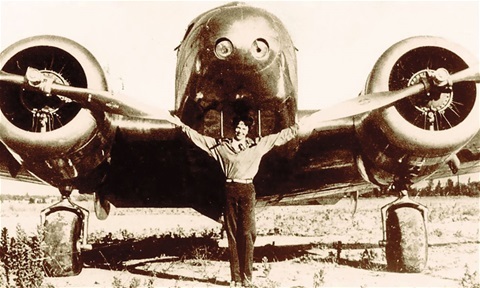 About 120 years ago on this date, Amelia Earhart (July 24, 1897-July 2, 1937) was born and became a flying legend. Both Amelia and the airplane grew up together. Amelia was about 6 years old when the Wright Brothers made their first flight. The picture shows how far aviation had come with the sleek Lockheed Electra aircraft which disappeared when Amelia was 40 years young. Women pilots are of special interest. They too have dreams so as to break the "glass ceiling" in a unique way. In keeping with Amelia's dream I can only imagine what she would be thinking were she here today while some are intent on turning such magnificent machines into bombs to destroy people. Unthinkable! Mother's name, "Amileta" was taken from Amelia's name as I was told by my maternal grandfather who never flew aboard an aircraft and showed no interest in such. I'm certain that many were inspired by the heroine who broke the mold of the household stereotype. Dreams keep the world moving forward. Without a dream or ideal not much happens. Every move forward begins with a dream. Risks are involved but a dream big enough will overcome the obstacles until it becomes real. Then, many are inspired while the dreamer becomes famous and well rewarded.